It was beautiful day! It was a little chilly, but the sun was shining and the sky was blue. 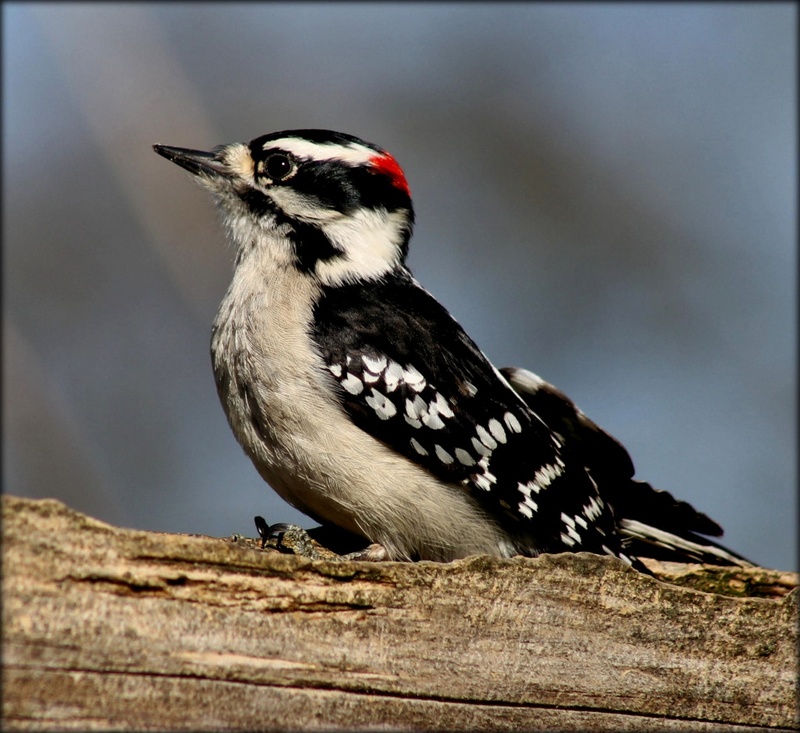 I captured this Hairy Woodpecker at my Mom's house, before we left for the party. He was taking a short break from eating sunflower seeds. Great catch . . how do you find these beautiful guys. I mean, even at your mother's house! Nice comp and dof. Colors are lovely. Great shot and a great story! My Mom is 94 and while her short term memory is impaired, she is still painting and is in the moment while I am with her. She lived independantly until she was 91. It's a beautiful capture, and pass on a big Happy Birthday to your cousin. How do you do this? What lens do you use? Another beautiful capture! Perfect! Happy Birthday to your cousin and may she enjoy 20 or more birthdays! Beautiful shot of a beautiful bird. @marytj Thank you, Mary! I'm using a Canon 75-300mm zoom lens. Wonderful shot, Carolyn. So crisp and lovely composition! Great clear shot! Love the pop of red on his head! I love it! I've tried several times to get pictures of one of these. I have gotten a few, but always from a distance so they're not too good. I love bird pictures. "fav"
Lovely shot! I always get a branch in the way....lol! Yep, this is a fave Carolyn - the clarity and detail are stunning! So pleased Virginia is still living a busy, full life. Good on her - I love reading about people with that level of energy and love of life. Hope she had a great party. This is sharp! Instant fav! Another fantastic bird shot Carolyn!! Wonderful detail captured. Great shot. Love the little bit of red on the back of his head! Beautiful bird, sharp shot. Congrats to your cousin. I love the little splash of red. Your day sounds a lot nicer then mine. It's been overcast here for the last few days and we have had a decent amount of rain. Sho'!! This is a GREAT capture!! omg such a brilliant shot....looks like you must have been very close!!! faved! Gorgeous little chap! I hope your friend had a lovely birthday! Absolutely beautiful close up, so much detail. Excellent story re your cousin, good genes in your family. He is beautiful! And thanks for sharing about yr cousin, very inspiring! Lovely and crisp shot. A FAV for me. he looks proud to be a woodpecker. Outstanding capture of this beautiful woodpecker. I have to fav this one. Splendid Portrait of a "Woody"! Excellent close up! Such a great capture of a lovely looking bird. Great capture .. I know how hard it is to catch these! Oh wow this is amazing clarity and the colors, its perfect, fav!!! What beautiful birds these are--and so hard to photograph because they are constantly moving. Nice one! What a wonderful shot, and your album is lovely too. I never get tired of looking at bird photos. fabulous shot! You constantly amaze me! Fav! Love that pop of red! My son's grandmother will be 92 this year, and she still lives by herself. Gorgeous birds, the woodpecker. Lovely shot! Gorgeous, lovely DOF and colours! Wow, the details are amazing. Congrats on the POP page! Amazing detail, Carolyn. You really seem to have picked a great lens as it performs beautifully. Great shot! Nice clarity and detail on this guy.